Last edited by EricaLubarsky; 12-31-2018 at 10:20 PM. SMFH. I hope they build this team around Doncic & DSJ... The rest are expendable. And I mean the rest, including Barnes & Jordan. Record for turnovers in a game is 45 so as hard as the mavs have tried they won't be beating that. I don't want to waste Luka & DSJ like we wasted Dirk until we didn't waste him. It's time to be aggressive now. Starting this year. I wonder what Ace Ventura and Aquaman were just talking about? Does he have a no trade clause in his contract? I like the potential of Brunson and Kleber too, but I wouldn't hesitate to trade either in the right deal. 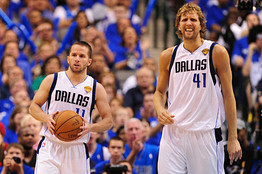 When will the Mavs win one on the road? I'm guessing Rick has given up, Oklahoma sure hasn't. This is Russ's favorite part of the game. Stat padding time. That's actually pretty great experience for this lineup though. LOL, he looked kinda pissed when he was taken out of the game with 2:45 left. Ughh I hate these giving up these games when we are so close to .500. I know the chance was small that we would win but if we really want to make the playoffs we have to go for the W in every game and not take games off. 2nd night of B2B going from home to away against the same team doesn't help. Mavs just chucking whatever to get this game over with. The sooner we decide to move and make this team around Luka the soonest we will be in the playoffs and a contender. We've been bad, but honestly the Thunder built a 22 point lead in the first half and since then the Mavs have treaded water and even cut into it. B2Bs are brutal and Mavs have a pathological allergy to playing on the road. Part of the brutality was watching them cut it down to 12 or 14 and then do something stupid....like Wes dribbling off his foot for instance. Clearly a lack of focus. Last edited by rimrocker; 12-31-2018 at 10:56 PM. Fing pathetic. No surprise the Thunder were going to come out playing hard. We never remotely met that intensity. Game over. The rest of the game was piling on different types of garbage. Whoa, overreaction New Year's Party! We need to start with getting rid of Matthews. I find that a player that knows he has no place on the team is inevitably a cancer. But the bigger issue is that he and Barnes are essentially the same player, except that Barnes has become the better 3 point shooter. Still, they are so ridiculously one dimensional. You can live with Barnes because he is good at that dimension, but Wes is just pure crap if he isn't hitting threes. I am a bit worried that the team is falling apart though because of the turnovers. Such a lack of discipline means they are starting to tune out coach. Have not watched, but putting Matthews back into the starting lineup apparently went as expected. Could honestly also being burned out a little bit. It's the Western Conference, there are no easy games, especially not for those middle-of-the-pack teams. You hope for a slower week or two and then realize the Mavs have the toughest remaining schedule of the whole league. Can we move to the East please and play all the bottom feeders four times? How did DJ get six TOs btw.? This is why I largely do not like other teams players. F em, until they wear our jersey.